I grew up believing that being born of water was a reference to being born from the mother’s womb. The idea here is that Spirit = Spirit and water = flesh. Nicodemus has just questioned Jesus how someone can be born again. He had in mind re-entering his mother’s womb, which he rightly saw as an impossibility. The argument, as I was told, is that Jesus says one must be born from the womb first and then again of or by the Spirit. It’s like saying, “Well, first one must exist, that is, be born, then one must be spiritually born.” But why would Jesus need to say one has to be physically born from the womb? That seems a bit strange. And if Nicodemus says womb, why would Jesus say water instead of womb? Maybe it refers to amniotic fluid, but that seems a stretch to me (though that was the teaching I grew up with). Now, as I take a step back, I wonder if water is actually a reference to baptism (as so many others have argued). If given the choice between being born from the womb and being born via baptism, it seems to make the most obvious (on the surface) sense that Jesus had (water) baptism in mind. The idea here is that repentance and baptism are required to enter the kingdom of God, not merely born of the flesh, that is, not merely being a physical descendant of Abraham. Remember that entering the kingdom of God for Christians is akin to being a member of the nation of Israel for a Jew; to be counted among the saved is everything. If one wants to truly gain the inheritance of the Jew, one has to be physically circumcised as well as circumcised of the heart. It is both an internal and external reality. Could it be that to be a true Christian, to be a citizen of the kingdom of God, one also has an internal and external reality, that is, repentance and baptism? Of course repentance is outward as well. It is a turning of one’s life from one direction to another, from darkness to light. So repentance may not be internal as much as an outward sign, like baptism, that one’s heart has changed. In other words, if one truly has turned to God for salvation, and has embraced the gospel, then one should repent, that is, live differently. If that formula is true then one should get baptized too. Right? Is it not commanded? What does “by the washing of regeneration and renewal of the Holy Spirit” mean? 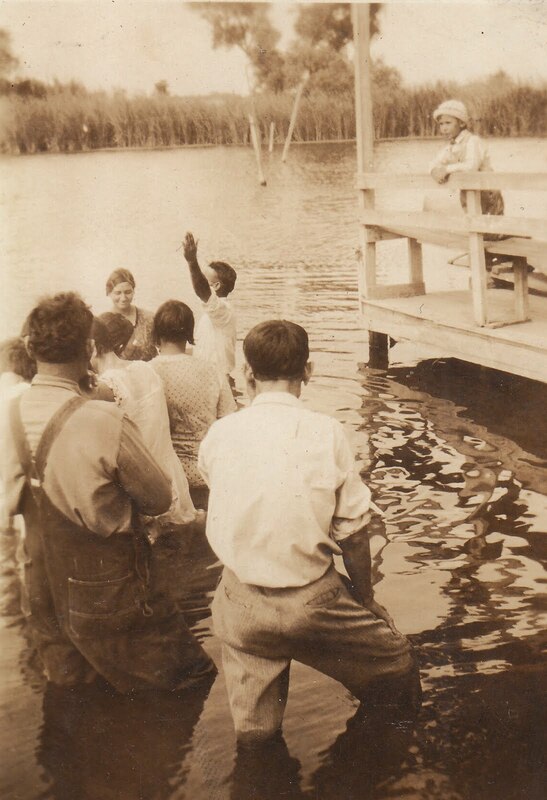 For some the washing of regeneration is the act of water baptism. I think this is the view most common among the “church fathers” and has remained so in many Christian quarters. That the act is also spiritual is because it is combined with the renewal of the Holy Spirit. Is this the right way to understand Paul? Is he saying that water baptism and renewal by the Spirit make us heirs? If so, is the logic then that baptism is a part of the process of “being justified by his grace?” My sense is that the washing of regeneration may be referring to water baptism, but the washing and the renewal may be the same thing, that is the work of the Holy Spirit is in changing us because of God’s mercy and grace. Still, there are enough verses in the Bible linking baptism to the process of salvation to warrant consideration that baptism is in view here. It seems that baptism, according to Peter, corresponds in some way to Noah and his family being brought safely through the flood, which may correspond to Christ’s death in some way. I find this a bit confusing. And then, in language surprising to the sola fide crowd, Peter claims that baptism saves us because it is an appeal to God for a good conscience. How can baptism save anyone? We see that Noah was saved by God and by the ark, that is, by divine providence and by the natural laws that make boats float on water. How, then, does baptism correspond to this, if it does? Or is the corresponding only to Christ’s suffering and his preaching to those in prison (which I take to be Hell or some kind of purgatorial limbo)? Or could the correspondence be that through baptism we make the appeal to God in the same way those in prison must have after meeting Christ face to face and hearing his proclamation? The fact is Peter says baptism saves us. How? If baptism is “only” symbolic, how can one be saved by a symbol? If (water) baptism comes only after turning to God, then how does it save us? I am convinced that salvation is a gift from God. I am convinced that I came into this world with a deadly allergy to the truth of God, His gospel, and all things eternal. And I am convinced that were it not for the work of the Holy Spirit—against my very will—I would never have seen my need for salvation and never have turned to God for mercy and never have believed the foolishness of the cross as the great wisdom that it is. And yet, though I have always considered the classic Reformation creed of salvation through faith alone, I cannot help but notice that the apostles also included baptism as part of the process. Have I misunderstood the process of salvation? James says faith without works is a dead faith. I believe that too. Could faith without baptism be an incomplete faith? If so, would it be incomplete only if there is a community of faith within which the believer participates, and in which baptism plays a similar role to what a wedding ceremony plays? Is faith without baptism like a common law marriage, it’s real at one level but un-confessed or un-established at another? Tentative conclusion: Though there can be no faith apart from God bringing it about, that is, causing faith in the individual as a gift, baptism is proclaimed by the apostles as important to the process of salvation. The correlation of baptism with salvation beyond mere symbolism is not clear to me. Could baptism be like Christ on the cross in that what I do with it, how I understanding it and it’s relationship to my faith, says a great deal about my faith. Christ on the cross is a touchstone of faith. If I look at Christ and do not see that he got what I deserve then my faith is nothing. Can we say anything similar about baptism? If I say I have faith but refuse baptism is my faith suspect? Is baptism a kind of touchstone? If so, is that it’s primary purpose? de Brantes: Some folks have questioned the intertwining in your work, especially in THE SACRIFICE, between Christian motifs, for example the recitation of the “Our Father,” and ideas more archaic, more pagan, such as the character of Maria, the “good witch.” This leads to a certain confusion . . . Are you or are you not a Christian filmmaker? Tarkovsky: I believe that it’s truly not important to know if I subscribe to certain beliefs, whether pagan, Catholic, Orthodox, or simply Christian. The important thing is the work itself. It seems to me better to judge the work from a general perspective, and not to be searching for contradictions which some wish to see in my work. A work of art isn’t always a mirror reflection of the inner world of the artist, particularly when it comes to the smallest of details. While it’s true, there exists a certain logical connection . . . it’s possible for there to be an opposition to the personal beliefs of the artist. Also, when I directed this film, I was convinced it had to address itself to all types of audiences. When I was very young I asked my father, “Does God exist—yes or no?” And he answered me brilliantly: “For the unbeliever, no, for the believer, yes!” This problem is very important. I want to say in relation to this that it’s possible to interpret the film in different ways. For instance, those who are interested in various supernatural phenomena will search for the meaning of the film in the relationship between the postman and the witch, for them these two characters will provide the principle action. Believers are going to respond most sensitively to Alexander’s prayer to God, and for them the whole film will develop around this. And finally a third category of viewers who don’t believe in anything will imagine that Alexander is a bit sick, that he’s psychologically unbalanced as a result of war and fear. Consequently many kinds of viewers will perceive the film in their own way. My opinion is that its necessary to afford the spectator the freedom to interpret the film according to their own inner vision of the world, and not from the point of view that I would impose upon him. For my aim is to show life, to render an image, the tragic, dramatic image of the soul of modern man. In conclusion, can you imagine such a film being directed by a non-believer? I can’t. de Brantes: You’ve said that man should create in the image and likeness of the Creator . . .
Tarkovsky: It’s all together important and not important. For me, it’s like breathing air . . .
de Brantes: But how do you distinguish the artist from the monk and from the saint? Tarkovsky: These are truly different paths. The saint, the monk, refuses to create because he’s not participating in life. The banner of the saint or the monk is non-participation. This has a lot in common with Buddhist and Oriental philosophy. . . . But the artist, the poor artist . . . he finds himself again in the mud amidst everything that happens. But we also know about the example of the French poet who rejected being a poet, Rimbaud. There are a lot of people like that. For the monk, I fee a sort of compassion, because he lives with only part of himself. As for the artist, he has a tendency to scatter himself, to make mistakes, to sully himself, jeopardizing his soul. But this isn’t to characterize the saint and the poet as angel and devil. It’s quite simply people who find themselves in some very dissimilar situations. The saint will have salvation, the artist perhaps not. In this sense I believe in the grace which descends upon you from above, just like that . . . Herman Hesse had this thought: “All my life I aspired to be a saint, but I am a sinner. I can only count on inspiration from on high.” What he’s saying is that he’s unable to be consistent. There’s a parallel between the saint and artist, but there are some different problems. . . . The essential thing is that one live in a just and proper way; seeking to imitate the Creator, or seeking his salvation, saving oneself, or searching to create a far richer spiritual climate for the entire world. Who knows how much time remains for any of us? One must live thinking that tomorrow we may have to deliver our soul up to God. You ask me a question to which some geniuses have dedicated their whole life. That’s what it is to make a film. I want to speak to this in my film about Saint Anthony,** in order to understand and explain this unbearable problem for man. In the end to die or not to die isn’t a problem, we all will die, either together or one after the other . . .
* This interview was found in Andrei Tarkovsky Interviews, ed. John Gianvito, 2006, Univ. Press of Mississippi. ** Andrei Tarkovsky died before he could make his film about Saint Anthony. He was fascinated with Saint Anthony because, for him, the saint represents the choice to forsake “everything for the desert.” That includes forsaking communion, which is important in the Orthodox Church, for the purpose of saving himself. Tarkovsky was an artist fascinated with that kind of religious tension. What does it mean to master something? You know the phrase, “Practice makes perfect.” In college I had a friend who what a music major. He is a very talented musician and composer. He had spent most of his life practicing. He taught me that practice makes really good, but doesn’t produce perfection; something else is required beyond “mere” practice for perfection. That perspective rings true for me. It is not only because to speak of perfection in the arts is to miss the point at some deep level, but that practice must be combined with something else, maybe several things, in order to reach its highest level. What are those other things? Love for the subject? Passion for knowledge? A broader perspective? An appreciative audience? Specific DNA? The grace of God? Certainly the grace of God. Better than speaking of perfection, I would suggest it is better to speak of mastery. Mastery implies both process and variability. I might master something and so might you, but we would arrive at different end points. That is why there are many great artists in every field and they are all unique. But the idea of mastery also implies a potential series of end points, a process that never really ends. Maybe we should more liberally use the term “practice” the way we say one “practices law” or “practices medicine.” But then have we given up on perfection? Maybe. Mastery is a process, not necessarily an end. But when mastery is an end is is a different end than perfection. Or is it? I am not sure. I do not understand all the various nuances that Segovia is working on with Zaczek, but I love the idea that even a master like Zaczek can still improve. Are there different levels of master? There must be. I am fluent in English, which means that as some level I have mastered the language, yet I am not a master of English in terms of grammar, or poetry, or many of the other aspects and possibilities of the language. There are many masters of English that far outshine me at every possible level. We are a mildly aspiring musical family. Though our knowledge and proficiency is rudimentary, we love the idea of playing music. In music none of us are masters in any sense of the word. I have been playing guitar for many years, but never studied the instrument like I should, so my skills are poorer than they might be. My eldest has been studying piano for several years. She is beginning to get quite good for her age. Now she is likely to take up guitar in addition to piano. I just bought her a guitar, really one for the family since I will use it too. It is a classical guitar, which means it sounds beautiful, but it comes freighted, in a sense, with the tradition of classical guitar, a kind of guitar playing that is of the highest standards. Some say the classical guitar is the most difficult of all the orchestral instruments to master. I can believe it, though I am not fully convinced. Regardless, it is not the guitar that becomes the master, it is the player, and the player will always fall short somewhere. When we think of mastering something like an instrument we are using the word to mean something like a person eminently skilled in something, as an occupation, art, or science. What makes the idea of mastery somewhat of a mystery is that being “eminently skilled” is not something that can be definitively measured. We tend to know it when we see it, but defining mastery is difficult and maybe impossible. Probably the best way to know what it is to master something is to seek out someone who has. And likely the best way to know if one has mastered something is to seek the judgement of another master. This can be tricky for even masters are often committed to their own perspectives and experience, and we know that mastery can be rather flexible. Below is another clip from Andrés Segovia’s Master Class. This time with Richard Johnson taking his final exam. The pressure on Johnson is palpable. Without pressure there can be no mastery. Someone like Johnson can impress most all of us, but he is not going to impress Segovia quite as easily. That striving to be deemed worthy is both nerve wracking and required for mastery. But I am stuck by the idea that Johnson would not be there, feeling the pressure, working hard, demonstrating the results of thousands of hours of practice, if he did not also love playing the guitar, and love all the rest that goes with it. Which makes me think of my kids. I want my children to be masters at something, or several things. I recognize that I can easily live vicariously through their triumphs, and therefore I can push them too much for my sake rather than theirs. But I also know there is a value to mastery that is generally unknown to children. A parent is in a tricky situation trying to determine what subjects are best for his or her children, and how much to push them towards excellence. Even with traditional subjects, like math and grammar, we know one can get through life just fine without being a master of those subjects. So how far should one go? And to what purpose? And, as a Christian parent, what value do I place on mastery of anything in light of faith? At some level mastery has to be organic. True mastery will come at that intersection of hard work, dedication, capability, and curiosity (and maybe other factors). Apply oneself, include sufficient resources, along with a good teacher, and one has a chance at becoming a master. But it is that organic element that is critical. It must arise, at some level, from within the individual. It must come forth naturally. And when it does it can last a lifetime. Here is Segovia many years later, not long before his death, performing live in Spain. There is an old man, doing what he has done for most of his life. He will always be one of the greatest masters of the guitar. As a parent I want my children to find that thing which they will master. I want them to become great at something. On the other hand, none of this matters in the big picture. If they do not love others and do not love God all their mastery will be nothing. I know this post is mostly a lot of questions. But such topics bring out a lot of questions, and there are many people willing to provide answers. I, however, am still fumbling my way through those answers, but I can say that, for the most part, and though I have trouble with definitions, I can still recognize and appreciate the mastery of some masters. If you get tired of counting one, two, three, make up your own numbers, as shepherds used to do when they had to count sheep day in, day out. You can try using these sets of words instead of numbers, when you have to count to ten. Since I came from a newspaper family, with my two older brothers working on newspapers at that time, and my father still a writer though no longer an editor, I could see the need for such a paper as Peter described. But how are we going to start it? Peter did not pretend to be practical along these lines. “I enunciate the principles,” he declared grandly. “But where do we get the money?” I asked him, clinging to the “we,” though he was making clear his role as theorist. I have to say this reminds me of reading the story of L’Abri, the ministry of Francis and Edith Schaeffer in Switzerland. Many times they faced situations that only God could solve, which He did. I am reminded of how important having heroes of the faith can be. Who are the saints of whose lives we should be reading?